Please forgive me this bit of self-promotion but I’m elated. Tome Tender Book Reviews just posted their review of THE FEVER and it is pretty awesome. If we were having coffee I guess at some point I’d mention the lollipop tree. Yes, that’s right, lollipop tree. As we’ve seen with the previous post about the repurposed ballet pointe shoes, my darling bride is something of a crafter. We were recently invited to an event where she wanted to do something special. She’d seen this tree project somewhere and she wanted to do one. “Seems doable,” I naively said. Okay, there were no instructions that she could find but it seemed to be a simple enough idea. A planter, a dowel, a styrofoam ball, a few lollipops … sure, I said, we can do that. Of course, there were technical challenges to be overcome. Some were surprising. Like where the heck do you get lollipops? On the surface, it seems like a simple enough thing, but go browse the candy aisles. Most are inadequate (looped sticks) and then there is a question of the quantities. You need a LOT of lollipops. We settled on the one we could get in the most quantities, something called Dum-Dums … sort of a Tootsie-Roll Pop without the Tootsie. In fact, we originally considered using Tootsie-Roll Pops but the colors were less than desirable. At least the Dum-Dums were a sort of flowery pastel. All of the technical challenges fell to me, your faithful coffee partner. I found a planter bucket that seemed sufficient. 8 1/2 inches wide with a mild taper. I chose Plaster-of-Paris for the medium. I cut a length of pvc pipe and inserted it into the globby mess with a dowel inserted and painstakingly tried to anchor it to keep it level. It was mostly level. Without a proper shop to work in, it was hard to get it 100% perfect. Drilled a hole in the 10 inch styrofoam ball and inserted the dowel. It looked pretty good. Shortly after she started inserting the lollipops, darling bride decided the ball was going to be too big. I agreed. This required another trip to the craft store to go down a size. We probably could have gone down two sizes. The insertions were tedious but fairly easy, but I had to go back to get more pops TWICE. I estimate it took almost 600 lollipops. Most of the lower ones required a dab of hot glue to stay put. It was top heavy. Despite a gallon of Plaster-of-Paris, it was still fairly unstable. Off to the store for a bigger container, big enough to contain the smaller container. Luckily, it being the end of gardening season, I got a pretty good deal on a large ceramic pot. I used a combination of plastic bags and tissue paper to stabilize it and we topped it with almost ten pounds of decorative rocks to both add weight and fill in the gap between old and new pot. The combination of these two made this thing quite heavy. She finished it off with a wrapping of decorative ribbon around the “stem” and a wrapping of flowery garland around the base. One problem: while gluing the ribbon she accidentally glued the dowel to the pvc pipe. I had originally figured on pulling the top out for transport but it was tight in there so it had to travel assembled. We almost got to the venue before it tipped on a turn. The tinkle of rocks spilling out of the planter was unnerving but I managed to pull over and get it upright again. Amazingly it survived the tip in great shape, just needed to scoop the rocks up. I think it came out pretty good but I don’t think I’ll ever want to do one of these again … but we’ll see how long this lasts. It might make for for some emergency rations one day. I’m mostly just testing the FB/Wordpress share, but figured I might as well do a promo at the same time. Subscribe to my mailing list by clicking the “sign up” button at the top of the FBpage. I promise to never sell info and will only email you with information when it is absolutely vital. 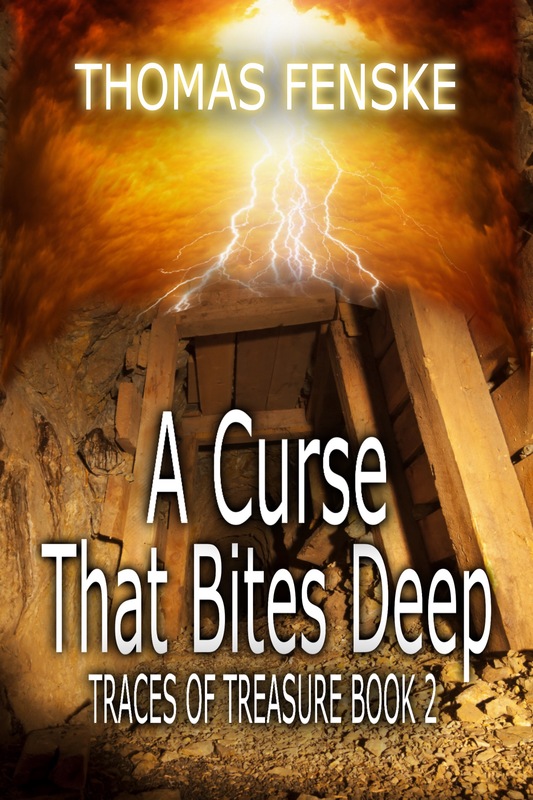 Just got the cover for the new book, A Curse That Bites Deep. 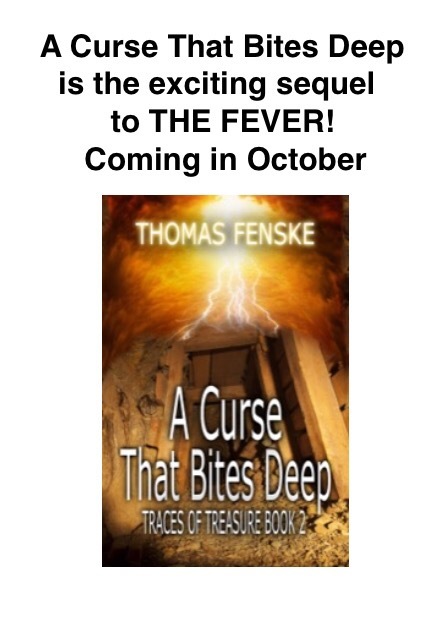 This is a sequel to The Fever and continues the story. Yes, there’s the whole plot line about the gold mine but it is a great murder mystery too. The book will be available in October, with eBook preorders starting in September. I suggest you subscribe to my mailing list so you won’t miss the publication news. I’m running a giveaway, for a paperback copy of THE FEVER to one lucky new subscriber who joins my list between now and August 15. Sorry, US mailing addresses only. Go to http://thefensk.com and click on the subscribe button, then click the link in the verification email. If we were having coffee, I’d mention my recent flashback. You see my wife has been a bit under the weather of late and I was just picking up a prescription for her. Oh, thanks for asking, I think she’ll be okay, but I glanced at the prescription on the way to the car and saw what she was prescribed and I was transported back in time. You see, it was 29 years ago that I participated in a drug study for that very drug. Yes, I was a paid guinea pig. I was living in Austin at the time, working a the University of Texas, and had long noted the regular advertisements in the student newspaper about drug testing opportunities. Christmas was coming and money was a little tight and the prospects of an easy $1200 seemed like a good idea. Easy. Yeah, right. You had to be clean, drug-wise. There was no problem with that. Ah, but you also had to be CLEAN, drug-wise, during the entire study. This was a little more intense. That meant, of course, no alcohol, but it also meant, well, no anything else. I mean caffeine, aspirin, cold remedies … nothing prescribed nor over-the-counter. No caffeine included no chocolate too because it indeed has caffeine. I passed the initial screening and passed the interview and so I had to begin decaffeinating myself. The protocol was to go into their facility on a Saturday night to enforce a 12 hour fast prior to dosing. It wasn’t like a blind test or anything, the drug was essentially already approved, this was what they called an absorption study. They’d monitor our blood for traces of the drug before, during, and after the dosing. It meant they needed a lot of blood draws. Apparently not as many as some because we didn’t qualify for a vascular catheter where they would stick us once and grab a vial whenever they needed No, we were stuck each and every time. Once before the dose, then hourly for four hours, then every two hours for a few draws, then the interval increased. Then, after 24 hours (and our 24-hour draw) we were released and had to return every day for the next six days for another 24-hour draw. Then a week off. This was repeated four times. You had to complete the entire series of tests to get the entire payout … half of it was a completion bonus so if you dropped out it wasn’t quite worth it. I have to admit that it was both interesting and grueling at the same time. It was Autumn and we basically stayed in a big dorm and watched football all day. They fed us okay. We had to keep track of our trusty clipboards. You got to know the guys who were ahead of you in line … it helped to notice that they were going to their next scheduled blood draw so you’d know you were up soon. They did not like you to mess up their schedule and they’d hunt you down. You became a bit of a connoisseur of phlebotomists. Some were awesome. Some, not so much, and you’d already be wincing inside when you turned down the hall and saw they were working. The hourly draws were the worse … God forbid you got bruised on both arms. We’d all try to alternate but if you got bruised on, say, your right arm, you might feel the need to double-up on the left the next two draws. One phlebotomist told me it wasn’t so much the person as you might just get a needle with a tiny defect. I didn’t believe him 100%. One woman bruised me every time. We developed all sorts of theories and techniques for avoiding injury, like slinking down in the chair to straighten out the arm and veins. They would laugh and say that didn’t matter but I swear it seemed to work for me. By the time we got to the every other hour intervals it seemed like a huge relief, and when it switched to every four hours, it was like heaven. There was one at 18-hours when most of us would be asleep in our assigned bunks and they’d come wake us. Seriously, the worst was the the six daily 24-hour draws because the facility was far across town from where I lived so I had to get up extra early (my scheduled time was 6:52AM) and drive all the way there for one stick, then go back home. After Saturday morning we’d have a week off. There was still no caffeine or any kind of medication allowed during the off week between testing weekends. Some people got sick and had to go on antibiotics … OUT. Some just couldn’t take it any more … OUT. There were pro-rated payments for participation but like I said, HALF of the amount was a completion bonus. There were also other tests going on, but we were pretty lucky because for three of our weekends the place was pretty empty. That fourth weekend, though, the facility was packed. And there were issues with thefts that weekend too. It obviously wasn’t our group … we had a camaraderie, but there was friction with the new groups, and with the thefts there was a lot of paranoia. With the tension, people were upset a lot of the time and we were all searched prior to leaving that weekend too. My sunglasses were taken which was stupid of somebody because they were prescription. I eventually found them in one of the dorms … I guess they weren’t interested when they found out they couldn’t see through them. The very last Saturday, when we got our checks after our last blood draw, they also had pots of coffee, bottles of coke, and chocolate cake & brownies waiting for us. It was an ordeal, to be sure, but like I said, it was interesting. This was for THAT drug. Huh. Hope it helps her. His next novel, A Curse That Bites Deep, is due out next month!